The Drexel University women’s soccer team is off to an outstanding start with a record of 4-3-4. One tie was against No. 25 Princeton University which showed the dominance of their defense and their ability to work together in the face of tough competition. (Photograph courtesy of Greg Carroccio). 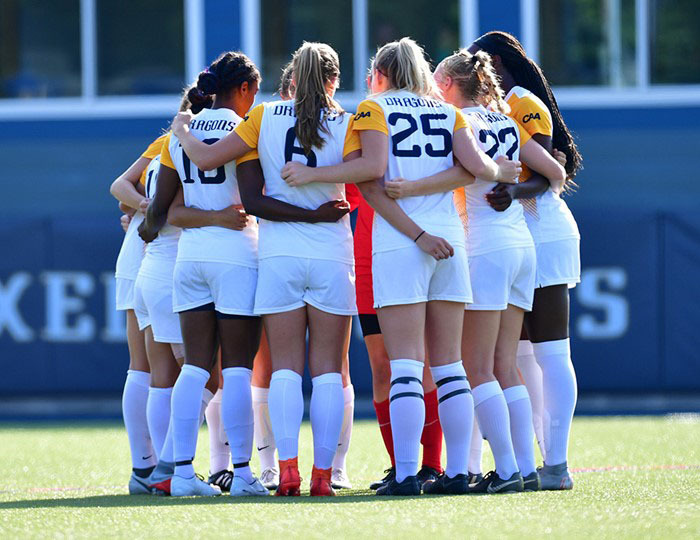 The Drexel University women’s soccer team is back for yet another season, and this year, they have gotten off to a great start. They began their season with a game against Rider University Aug. 17 at home at the Vidas Athletic Center. This game went to double overtime and ended as a 1-1 tie. They lost their next game, which was on the road against Rutgers University Aug. 19, 2-1. Their next two games, the first at home against Columbia University Aug. 24 and the other on the road against La Salle University Aug. 27, both went to double overtime. Like the first game of the season, the game against Columbia ended in a 1-1 tie. However, the Dragons got a overtime win in the second game on the road, marking their first win of the season. Their next two games were at home and both ended up being wins for the Dragons. The first of these two games was against St. John’s University Aug. 30 and the Dragons won 2-1. The next game went into overtime and Drexel pulled through for a 1-0 win over the University of Maryland Sept. 2. Their next 3 games, all on the road, did not go as well. Each one of them went into overtime, but Drexel could not pull off a win. The first of these three road games was against Saint Joseph’s University Sept. 6. This game yet again went into double overtime, and the Dragons tied 1-1. Their next road game was against the Providence College Sept. 13. This time, the Dragons tried to hold off the Friars, but ended up losing in overtime, 2-1. The last of these road games was against the No. 25 team, Princeton University, Sept. 16. Playing a ranked team is always a challenge, but the Dragons were able to hold them off and keep the game at a 0-0 tie. Their next two games were against some big names in the Colonial Athletic Association. The first was against James Madison University at home on Vidas field Sept. 20. The teams went back and forth in the first half, battling it out for the lead. However, JMU pulled ahead in the 35th minute when Claire Meiser scored a goal. They used the momentum from a Drexel runaway to create their own and slipped the ball. Previously, Drexel’s goalie, junior Libby Baeza, did a great job of keeping JMU out of the back of the net. She blocked a header before JMU scored that goal, preventing them from running away with the game. Drexel did not give up and tried till the last second to get the equalizer. Red shirt senior Kiera Hennessy took one last shot at goal with seconds left, but it was to no avail, as JMU won, 1-0. Drexel moved onto their next game against the College of Charleston Sept. 23, which was again on the road. This game somehow also went into double overtime, but Drexel grabbed the win in the end. Senior Shaelyn McCarty made a shot within the first three minutes and set a tone for the rest of the game. However, the remaining half was pretty even, with Charleston outshooting Drexel by two. The lead was taken by the Cougars in the 55th minute when Laura Ortega took a free kick and and took a bounce into the upper right corner of the net. The Dragons did not give up, and the equalizer was given by freshman Morgan Rees with an assist by senior Emma Heckenberg. Rees had another opportunity to get the winning goal, but could not pull it off and the game went into overtime. The game finally ended when McCarty made a shot from 20 yards out and ended the game in the 106th minute. The Dragons will now look to get another win against the College of William and Mary on the road Sept 30.